The second issue of Rachael Ray's E-newsletter hit my email inbox this week (you can sign up for it here). According to the newsletter, Rachael is running a contest for the best stuffing. You can enter your recipe to win a free subscription to Every Day with Rachael Ray for a year, plus a signed copy of the November issue. I am out of luck since the only stuffing recipes I have ever made are Rachael Ray's. Okay, we all know I would never second-guess Rachael Ray, but I think I am going to second-guess Rachael Ray. Let me tell you my first reaction to the menu. The kebabs sound great mostly because beer is involved. Then she loses me at the lamb - grilled lamb? Really? Not sure I could sell that to my friends. 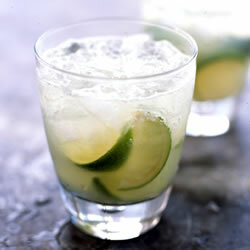 But, she gets me back at the Caipirinha. Have you heard of that drink? It is "the" drink in Brazil and is truly outstanding and unique. I can vouch for the 1905 salad - one of our favorites (especially Nicholas!) and so easy to make. It's from a restaurant in Florida. Well if Nicholas likes it, then I have to try it!